Tunstall Corporation produces a full line of Thermal-Disc™ Steam Traps. 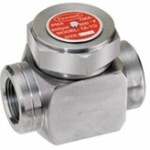 Available in 3/8″, 1/2″, 3/4″ and 1″ NPT connections, all the internal parts are stainless steel for long service life. The Tunstall Thermal-Disc™ operates using Bernoulli’s Theorem; as condensate enters the Thermal-Disc™ Trap, it lifts the thermal disc and discharges through outlet ports. Multiple outlet ports assure that the lift of the disc is parallel to the seat for efficient operation. Once the condensate reaches its flash point, the pressure on the top of the disc increases, due to higher velocity steam, causing the disc to snap closed. As the steam above the disc condenses, pressure above the disc will lower, and allow the disc to lift again and repeat the process. Note: Max. back pressure should not exceed 80% of the inlet pressure under any conditions of operation, otherwise the trap may not shut. 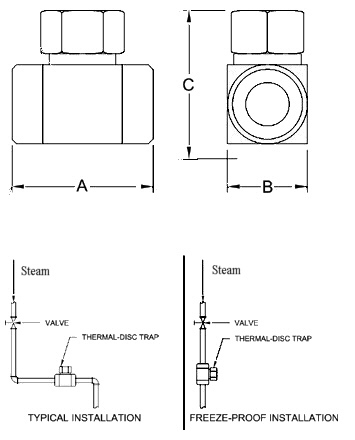 Valve installation is typically in the horizontal position as close to the equipment being drained as possible. A 20 mesh strainer is recommended upstream of the trap as is an isolation valve. Piping to and from the trap should be equal to the trap connection (one size larger is acceptable). Body material is not suitable for welding. Freeze proof installation is achieved by installing the trap vertically, discharging downward. All drains must be pitched towards the trap. Discharge piping must be self-draining.